Factors that trigger stress are simply too many to count. Life can be tough, and stress is a reality. Be it a niggling headache or a big issue at work. Advice on how to counter stress, too, ranges from the simple (take a nap) to complex (quit that job). But if you are looking for some immediate relief from whatever is stressing you out, here is a tasty suggestion: Eat a sweet potato! We associate this orange-fleshed root vegetable with several amazing health benefits, but few know or appreciate how good it is for your frayed nerves. When you are stressed, your body uses up vital minerals faster, and needs more serotonin, the chemical that promotes feelings of well-being and peace. Root vegetables are a good source of minerals, fiber and carbohydrates, which can help to boost serotonin production. Sweet potato works especially well as a stress buster because its subtle sweetness can offset your craving for sugar. The short term energy boost from eating the vegetable helps ease a tired body and overworked mind. 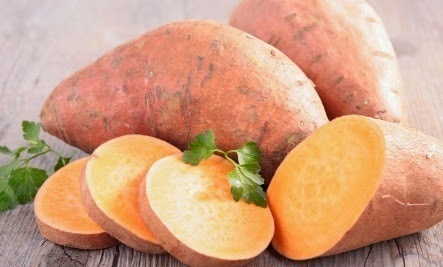 Bonus: the energy-release from sweet potato is slow and safe, because thanks to its high fiber content, the vegetable has a low glycemic index. Enjoy a sweet potato with dinner a couple of times a week, and keep stress away.